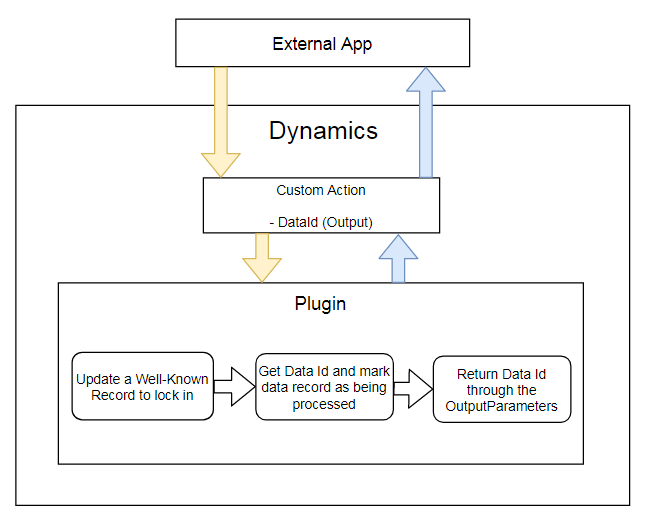 What if you had to synchronize access to Dynamics data from the external applications/components. Maybe there is a scheduled process that’s scheduled to run nightly on different servers, and that’s supposed to process that data, or maybe there is a multithreaded application that’s using multiple threads.. Whatever the case is, imagine that you need to ensure that those different processes/threads do not start processing the same data in parallel. You might think of some solution that involves external synchronization, but, to make things simple, you could just rely on Dynamics itself for this. When registering a plugin, we can choose a stage, and, depending on the stage, the plugin might run in a database transaction. 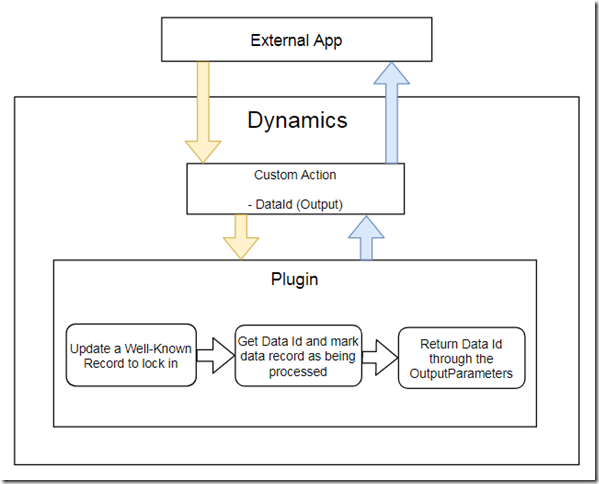 If we choose a stage where the plugin runs in a transaction, we can use such a plugin to update some kind of a well-known record in Dynamics. Since it’ll be happening in transaction, once the plugin starts, it will lock the record. So the second instance of the same plugin, which will be running in another transaction, will be locked out until the first transaction has finished. That’s the theory, but plugins are more for server-side processing, and I started this post by describing an external application scenario. 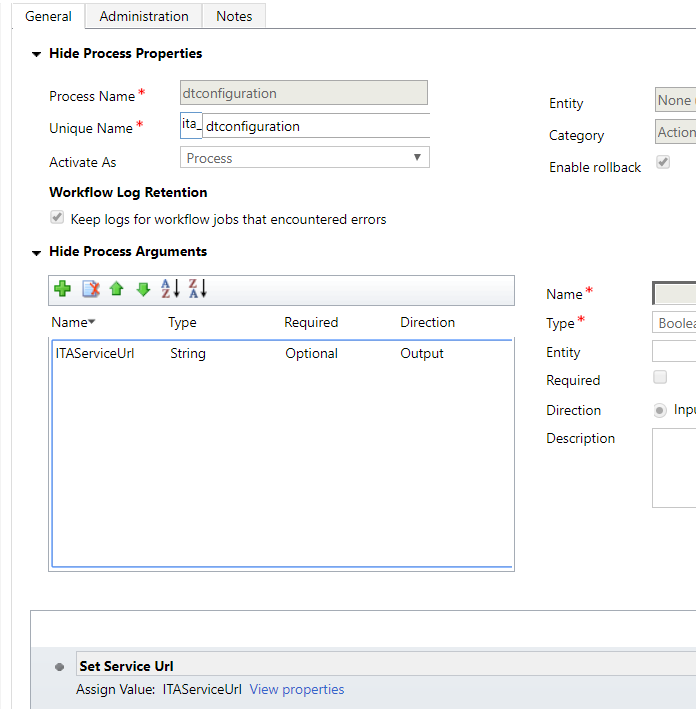 For example, imagine an entity that’s maintaining a queue entity id-s that your external app needs to process. You may have many instances of that app running on different servers, for instance, and, by using this approach, you can ensure that the same queued item is not processed twice. Most of the processing will still be happening in parallel, and the only time it will be sequential is when those applications will be querying the custom action to retrieve next data id. Now, what is that Well-Known record on the diagram? It does not matter really – it can be any record that’s always there. You might create a custom entity for that if you wanted to. Or you might use a dedicated account record..
Or you might use a query to find that account.. Or you might use a dedicated custom entity. As soon as your plugin is registered in the PostOperation, this will be happening in transaction. So no two plugins will be able to do this at the same time – they’ll be doing it sequentially. Last but not least, you may want to mark the records with that dataid is “processed” somehow (using statusreason.. or a dedicated field.. or somehow else), just so you the next call to the same custom action does not produce the same dataid as a result. Then, register the plugin on your custom action message, in the post operation, and that’s about it. Let’s start with the most important part(or so I thought when I started to look into this).. How do you get a file uploaded to Dynamics without resorting to the cumbersome “use notes” technique? Basically, it describes HTML5 approach, and that’s what what I used for the proof of concept. Actually, base64 string is exactly what is supposed to be stored in the Content attribute of the PluginAssembly entity, and, eventually, it is exactly what is happening there. BUT. This is where the limitation of web-based approach starts showing up. 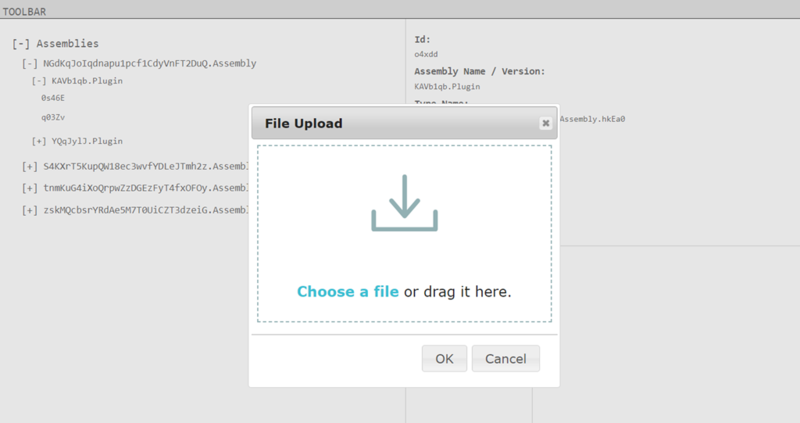 Which means that for every assembly being uploaded the tool needs to extract plugin / workflow classes from the assembly and create required PluginType records. Which means there should be a plugin, probably. Now, if there is a plugin, how do we pass that file to the plugin? var result = Sdk.request(“POST”, uri, resourceDetails) // Adding sample data so we can query against it. I may have done a few changes here and there when adopting it for this project, but, basically, it’s exactly that code. I am hoping I have not lost you yet, because this was exactly the point where I hit a bit of a roadblock. See, we can upload a file, we can pass it to a plugin, but it’s going to be a sandboxed plugin. And, even though we can use reflection there, it’s somewhat limited. Have you ever noticed that you can use the latest version of the plugin registration tool (v9) to register plugins in the 8.2 version of Dynamics? The interesting part is that, if you register a plugin compiled using V9 references, it will register ok even though it won’t work. This is because plugin registration tool will be able to parse the classes etc, it will create PluginAssembly and PluginType records in Dynamics, but, once Dynamics attempts to load that assembly, it will fail, since there will be no required references. That’s kind of an edge case, but this is where I was not, really, sure, if I was missing some other edge cases, so I figured I’d rather try to prototype something that provides the same functionality for now. Which meant I could not just use a plugin to parse those assemblies, since, in the scenario described above, it would not work. All reflection work is offloaded to the ItAintBoring.WebApp web application (that’s one of the projects in the solution). Which, for now, is hosted in Azure. One last note on the technical side: for the web App/Service, the plugin needs to know where the service hosted, so there is a custom action in the solution that has an output parameter, and there is a workflow step that sets that output parameter. The plugin, then, calls that custom action to get the location of the webservice. It’s all good except that this solution might not work too well for the upgrades. Imagine that somebody decides to deploy the solution and use a different location for the web app component. They would likely modify that custom action so it returns a different location. But, when an updated solution is deployed, it will reset that location back to the original one. In that sense, I guess using a configuration entity might be a better option. 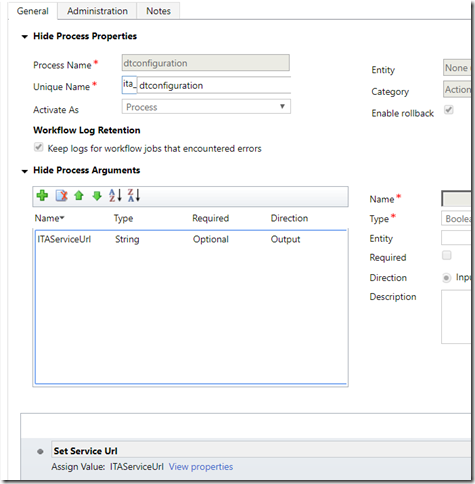 Dynamics 365, Power Apps, or is it the same now? Huh? I thought I was using Dynamics 365? The two platforms are merging..